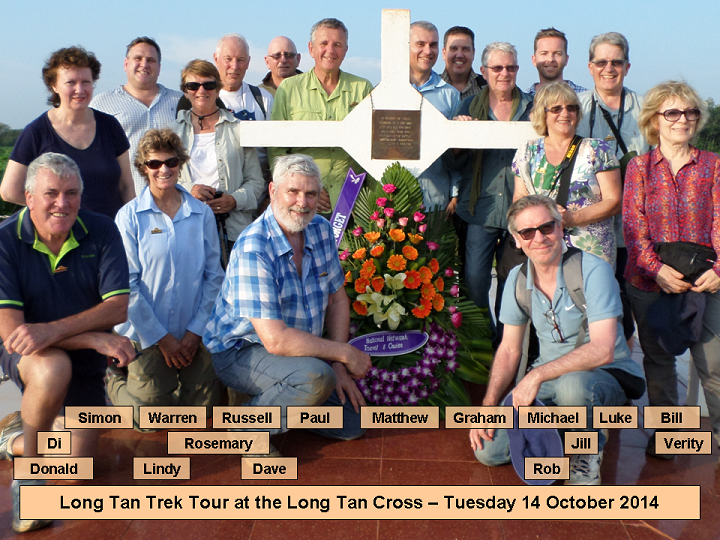 This page records the October 2014 Long Tan Trek Tour. 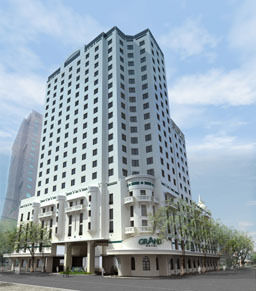 The Grand Hotel is centrally located, handy to the city centre and had recently been refurbished. 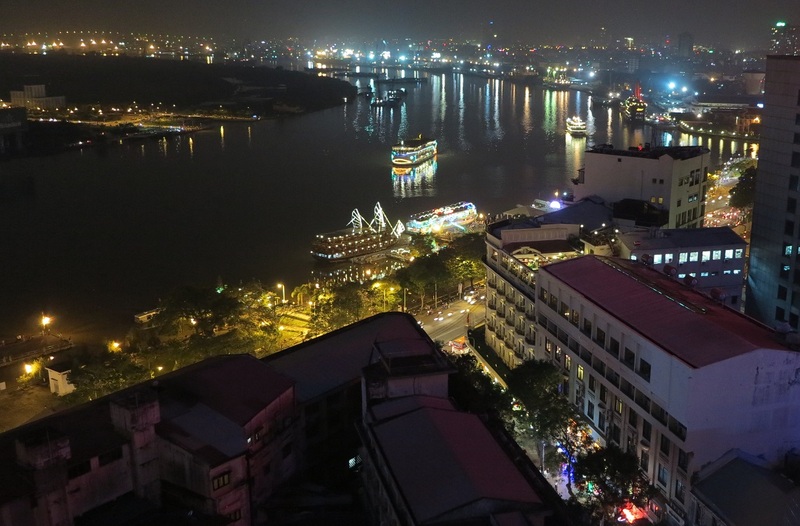 From the rooftop bar, there are great views of both the city and the river. Tour Guide Tina explains the Palace, once the residence of the serving President of South Viet Nam, is now renamed the "Reunification" Palace. There are efforts under way to locate the crater in which many of the NVA dead were buried. 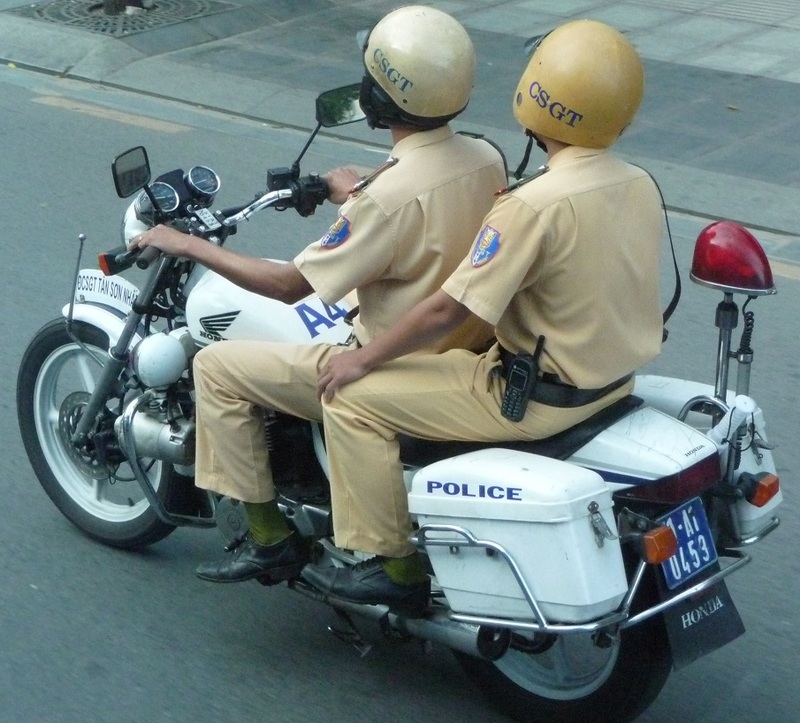 The Aussies are working with the VN Government on this search. still pock-mark a rubber plantation near the site of Balmoral (remember, this crater is now 50 years old). They still dwarf the sightseer and are still very impressive! The original cross was of special interest to Tour member, Verity, who was researching the battle for a play she's writing. and is now in rehearsals. 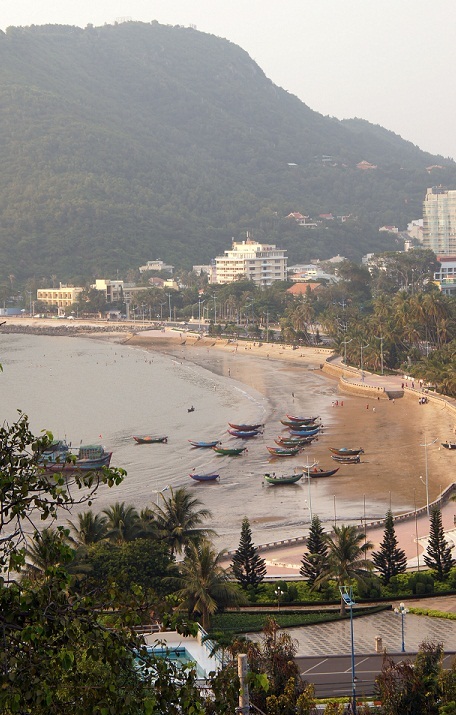 Vung Tau is a fishing and resort area and the step-off point for the many oil rigs off shore. The 'Pearly Gates' - the entrance to 1ATF after the public road had been diverted (after 1967). 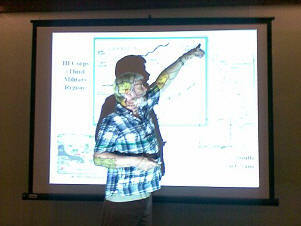 On an old helipad half-way up Nui Dat ('SAS Hill'), Dave, briefed the Tour on the layout of the 1ATF base. ...or is she asking how to use it? 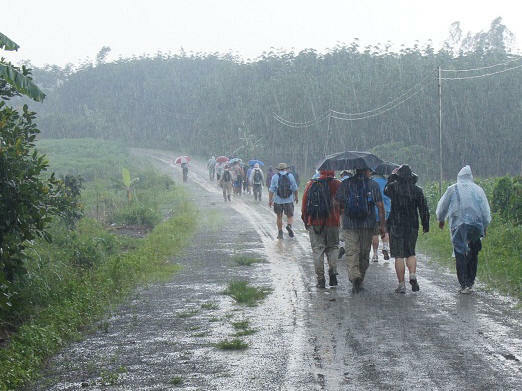 Strangely enough, it has only ever rained on the Trek Tour once - that was on the 2010 Trek... our second time out! Nui Dat 2 hill which overlooks the battlefield from the North. Many Tour members remarked on how small the actual battlefield was - just some 500 yards square. Tour Guide Ms Huong stands on what was the minefield, now a road. The rim of the Horseshoe is in the background. A pair of golden dragons protect the memorial to a Vietnamese heroine of the resistance of the French. ...but not like the old days - this time they were being charged $2 per round! Rosemary receives her Trek Plaque, watched by Tina. Marble Mountain - with caves used as secret wartime VC hospitals - now serves as a Buddhist sanctuary area. The mountains are surrounded by marble carving factories and merchants, but the marble is now all imported. The silk factory shows how silk is processed and turned into paintings, table linen etc. as it was in 1966-1972.
the beach and the low clouds. 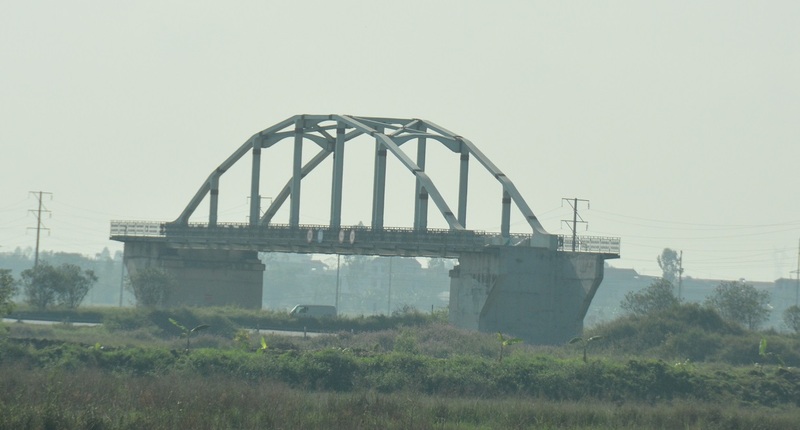 ...and the old (destroyed) bridge at Lang Co.
Tran Cao Van (Street) as it was in 1968 & (below) in Oct 2014. The Quang Tri citadel was heavily fought over in 1972. 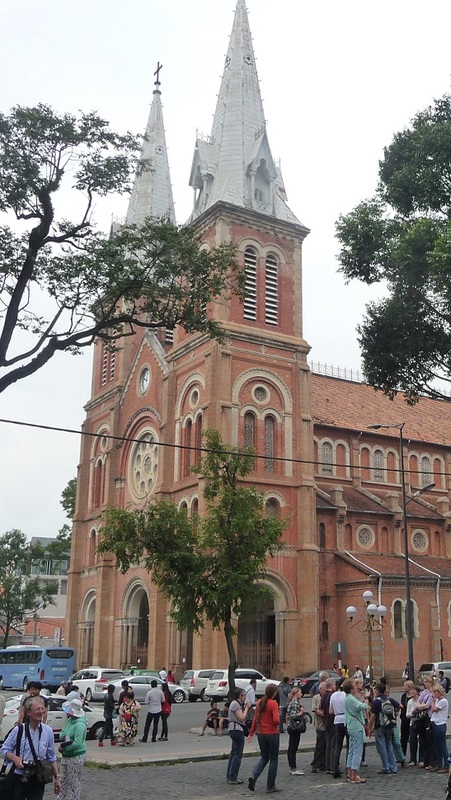 Long Hung Catholic Church - damaged in the Tet '72 fighting and left by Quang Tri city as a war monument. 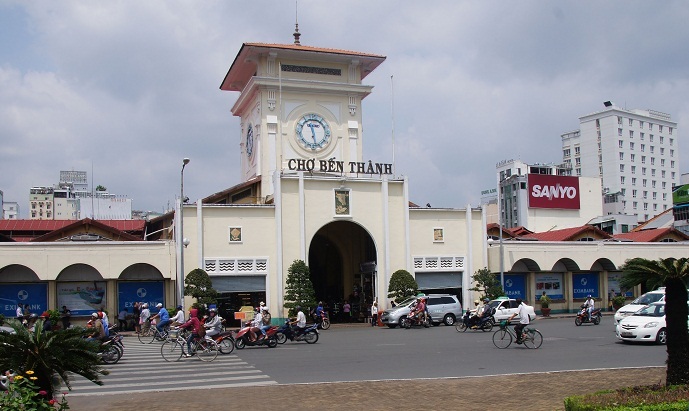 'Freedom Bridge' is the old Bailey Bridge spanning the Son Ben Hai (river) which was the actual demarcation between North and South Vietnam. The "Rockpile", with "Razor-back" visible to right rear. Rockpile was owned by the US, Razorback by the NVA. to the former battle site. 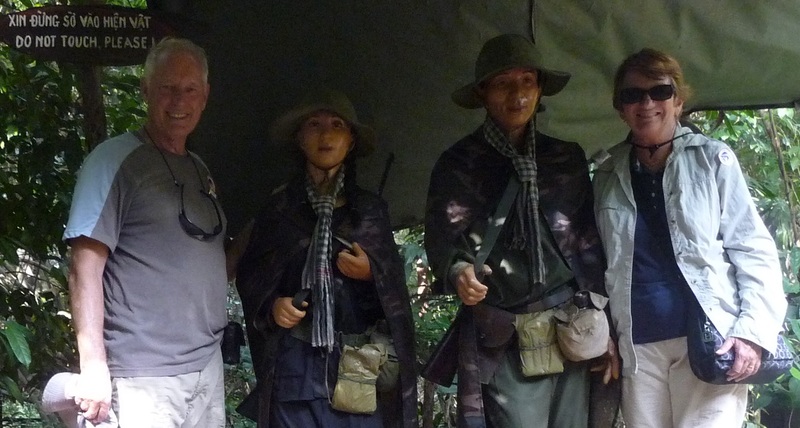 Khe Sanh has a great indoor and outdoor museum (seen in both photos here). They're assembling more displays at Khe Sanh - maybe to become a major tourist site? 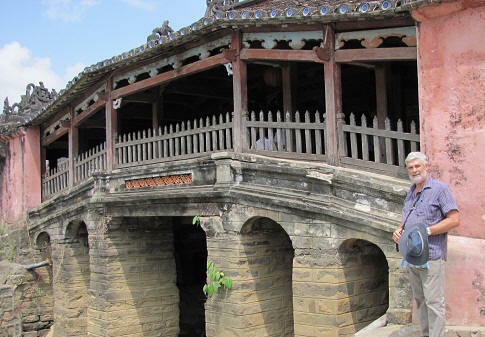 Both Da Krong and A Shau valleys offered spectacular views of rivers between huge mountain ranges. The streets of the Old Quarter were always crowded and busy. 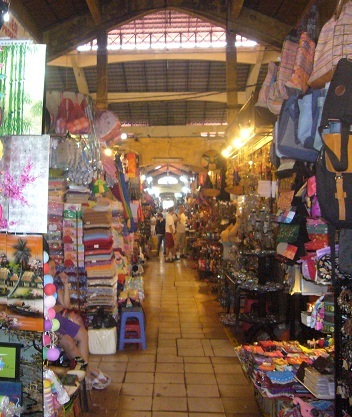 But most streets have merchandise 'themes', so it's fairly easy to find whatever you're looking for. 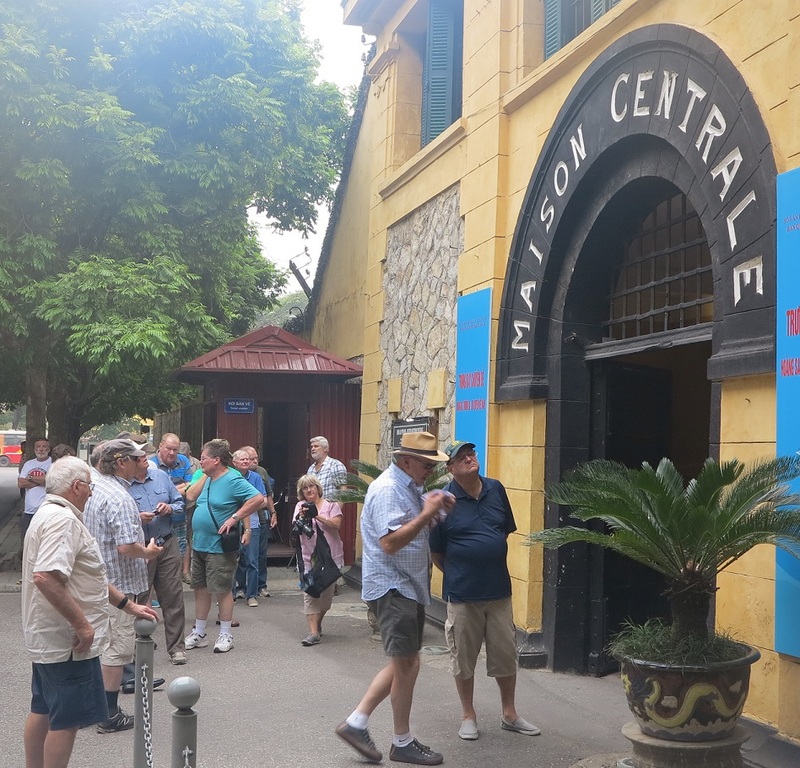 ...and the visit to the infamous 'Hanoi Hilton' capped off the day's activities. 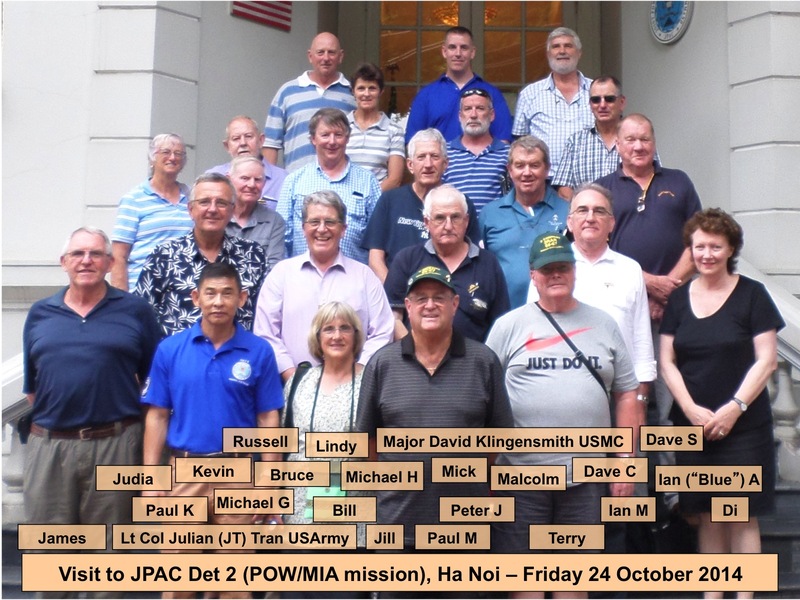 A briefing on the current state of POW-MIA searches was given to the Tour group by the US Marine "JPAC Detachment 2" office in Hanoi. The airstrip at Dien Bien Phu sits in the valley floor, still overlooked by the hills which once held the Viet Minh artillery. 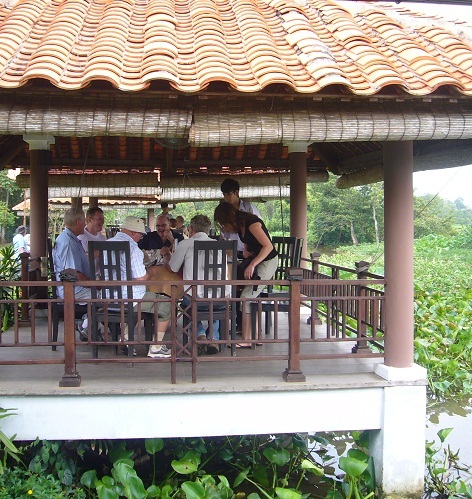 Picturesque views and terraced rice paddies belie the history of the area. 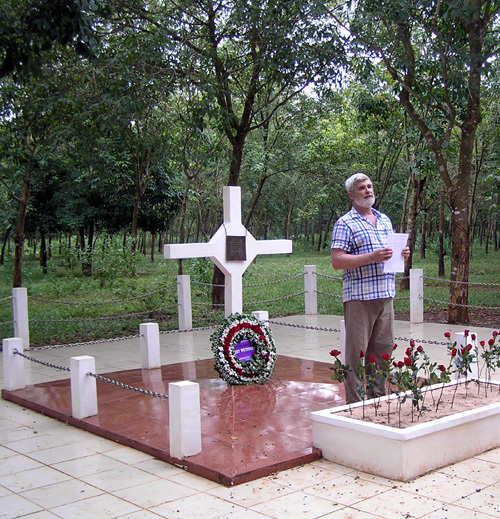 The large Viet Minh cemetery is well tended and offers visitors a view of the human price of the First Indo-China War - thousands of names are recorded by home Province and most of the grave stones are un-named. A second-hand tank on Hill A1 provided the opportunity for a (primarily) ex-3RAR Kodak Moment. Vietnam's largest bronze statue sits on top of the main "Dominique" hill, overlooking Dien Bien Phu town. The French memorial at DBP is one of only two foreign war memorials on Vietnamese soil - the other one being the ANZAC memorial cross at Long Tan. This French plinth is actually a memorial to various French units rather than to the Battle itself. DBP now has a new Museum which is one of the better museums in Viet Nam. It is just across the road from the Hero's Cemetery and is well worth an hour or two to visit. On the way back to the airport, we stopped for a quick look at the famous Bailey Bridge - still in daily use more than 60 years after it was put there by the French. 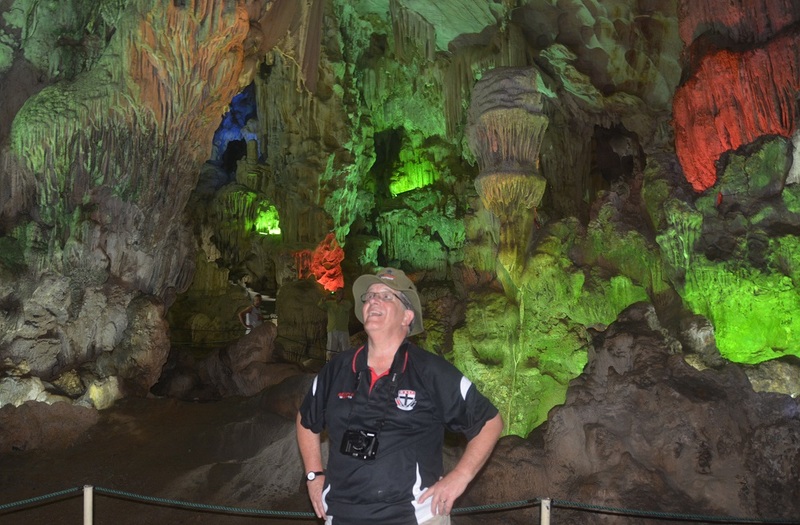 Spectacular and peaceful - Ha Long Bay well deserves its World Heritage listing. ...because even the shopping was on the water ! Mike, Jim, Bill, Jillian, Warren, Di and their cameras for their photos. 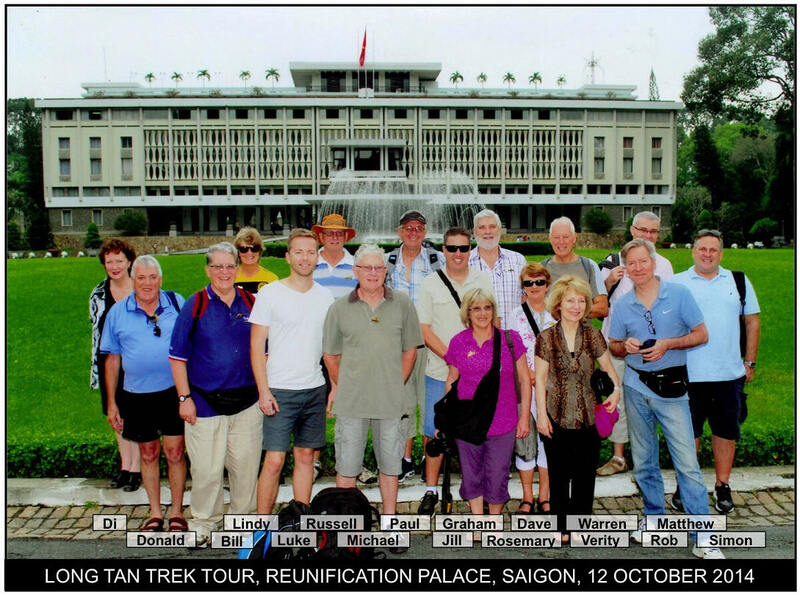 Di and Dave's 2014 Long Tan Trek Tour departed Australia 11 October with 15 passengers (11 gents, 4 ladies), with ages ranging from the 20s to the 70s. 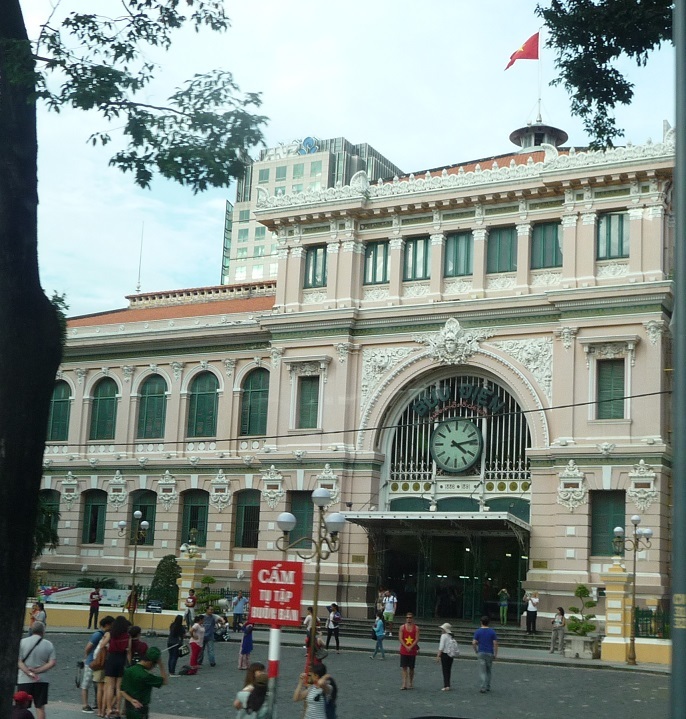 ...the Notre Dame Cathedral, the architecture of the central Post Office, (from the steps of the Post Office, you can still see the the building from which the last civilian evacuations from Saigon flew out in 1975 (there had been no US military in Saigon for 2.5 years). 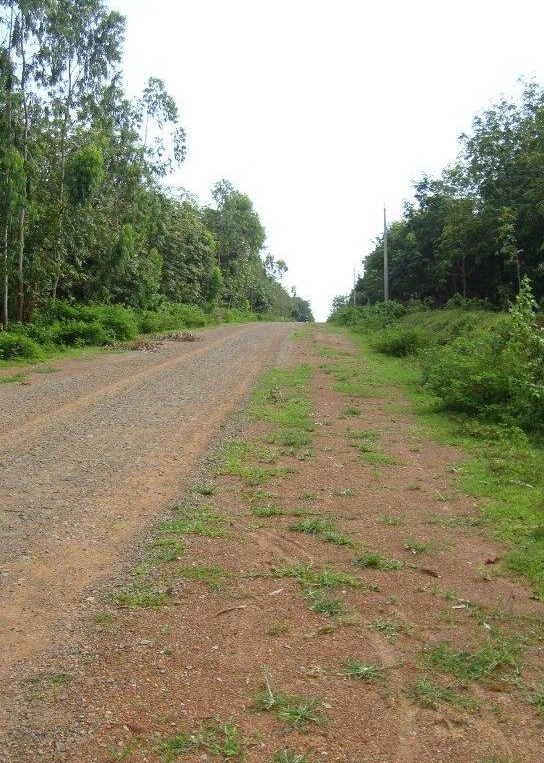 The Balmoral battle site is now a rubber plantation. The lighter area beyond the old rubber used to be the clearing in front of D Coy. 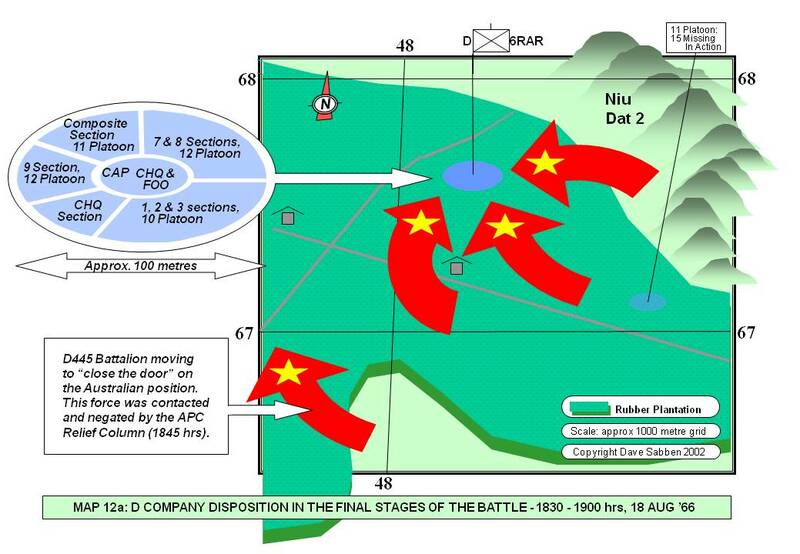 The layout of the Battalion position was explained, along with an account of the actions. 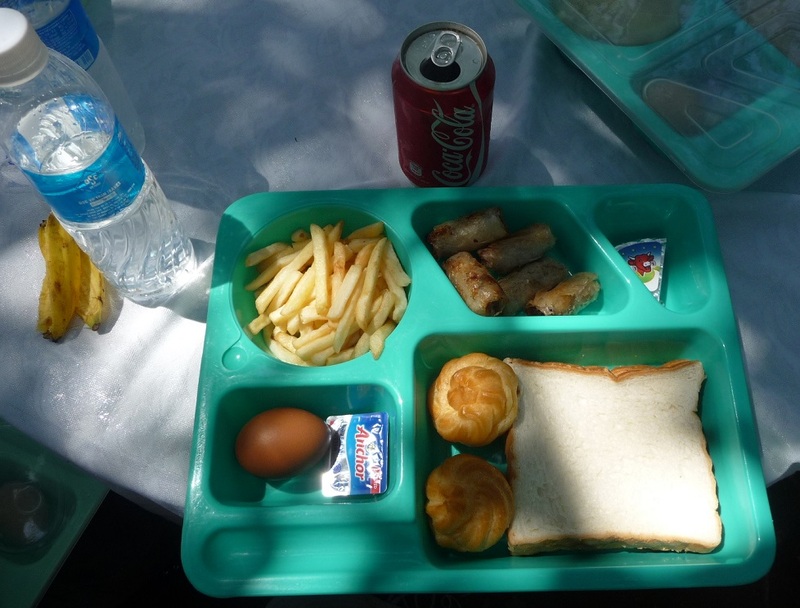 Then it was on to lunch in Bien Hoa, followed by a visit to the Dong Nai Museum which houses the original Long Tan cross (a replica stands in the Long Tan rubber plantation at the site of the battle). 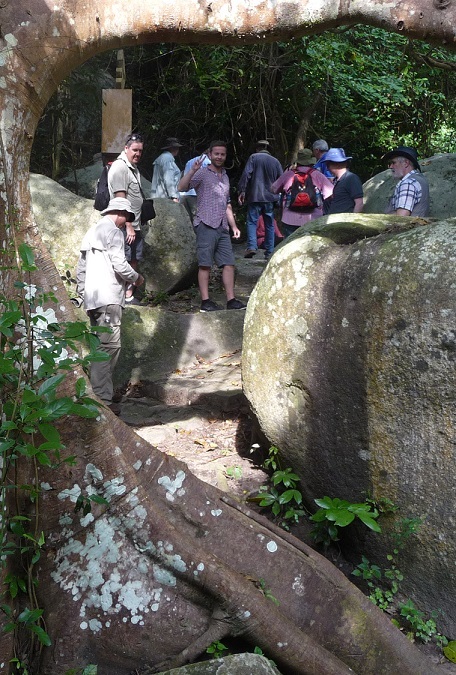 ...we bussed through the old 'Pearly Gates' to Nui Dat, where Dave and others explained the base layout and the NVA's intentions for a huge attack on the base set for the night of the 18th of August 1966. Along the way, there were a few stops for refreshments - chances for Dave to fill in more details of the movement back in 1966. Very little of the topography has changed in 48 years, tho' the slight rise that D/6 used for its final redoubt is now a slight depression. 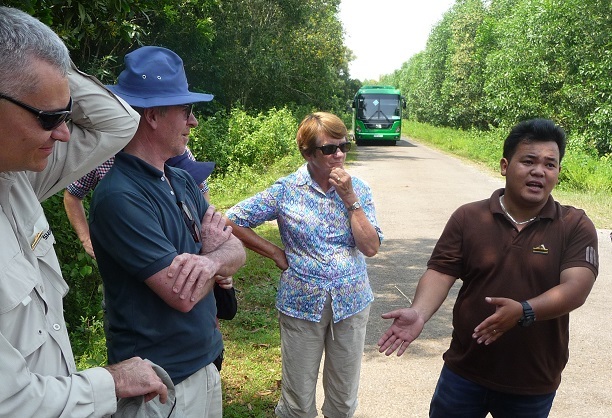 Unfortunately, the removal of the rubber trees made the battlefield much more "open" and "visible". It was difficult to imagine the lack of visibility within the plantation but, on the other hand, it was easy to imagine the lack of cover available on a flat piece of ground! Back to the Trek... As usual, the comments were that it was the highlight of the Tour - the Long Tan battlefield looks VERY similar to the way it looked in 1966. The walk was timed to be as long as the actual battle took - some 3.5 hours. We walked to all the places where the D/6 soldiers experienced significant events during the battle - the initial contact, the first and final Company positions, the left hook by 10 Platoon, the right hook by 12 Platoon, the place the Company HeadQuarters (CHQ) took the ammo resupply and, of course, the place of the heroic stand by 11 Platoon. ...and onto the Minh Dam Temple in the southern slopes of the Long Hai's. 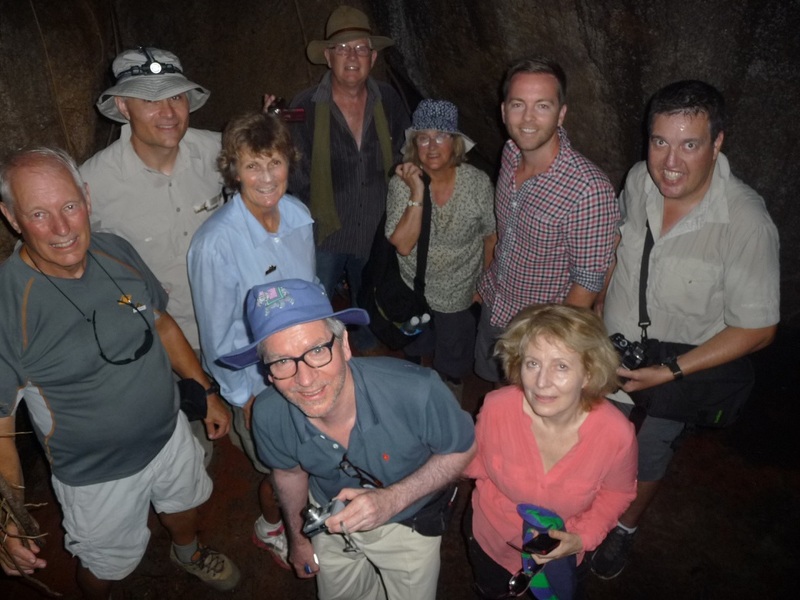 ...and thence to Cu Chi for a riverside lunch and a tour of the tunnels..
Warren and Rosemary made a couple of new friends and Bill fired off a few AK47 rounds... then it was back to Saigon. 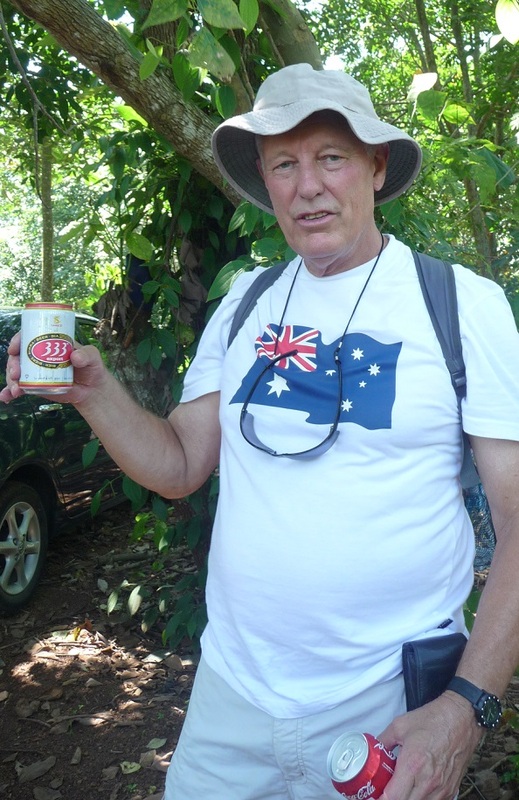 We were also joined by Tony T, an ex-Nasho and former OTU Scheyville graduate, who happened to be in the area when we were there and joined the group. After another 'Farewell Dinner' in Saigon, at which we handed a Trek plaque to each 'Trekker', we had a final night at the Grand, Saigon. Next day, for those not on the "Decisive Battlefields" extension tour, it was RTA (Return to Australia). From Saigon, the "Decisive Battlefields Tour" flew to Da Nang airport. ...where orders for bespoke silk clothing can be placed with a 24-hour delivery to the hotel. Silk pictures and silk-embroidered linen were also popular purchases. The next day was a 'day off' - to recover from the hectic first week and prepare for the hectic week to come. A little relax and a little sightseeing, and we were ready for more. 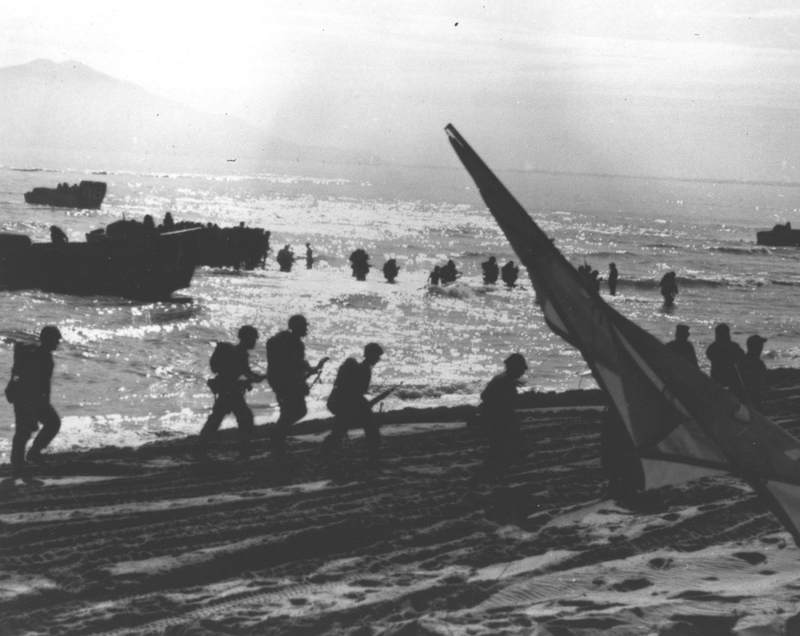 and then to Red Beach II, where the first US combat troops (Marines) landed in 1965. 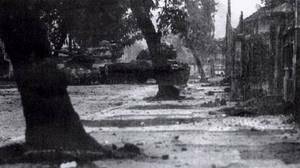 In the afternoon we moved north of the River, to the Citadel, where the main Tet 1968 resistance was experienced. The next day we bussed north to the DMZ. On the way we stopped off at the Long Hung Catholic church (which is kept in its 1970's condition as a war memorial to the fighting in Quang Tri), Quang Tri Citadel, Dong Ha (the logistics centre for the DMZ), and then to Cua Viet (the river-mouth sea port). 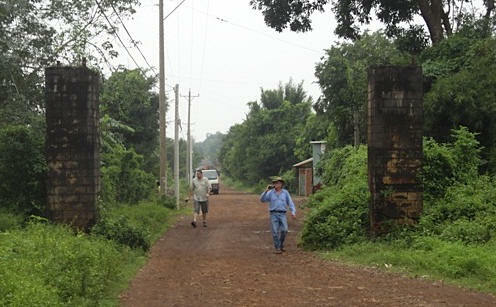 ...and on to the tunnels at Vinh Moc, where a whole village went underground for the war years. 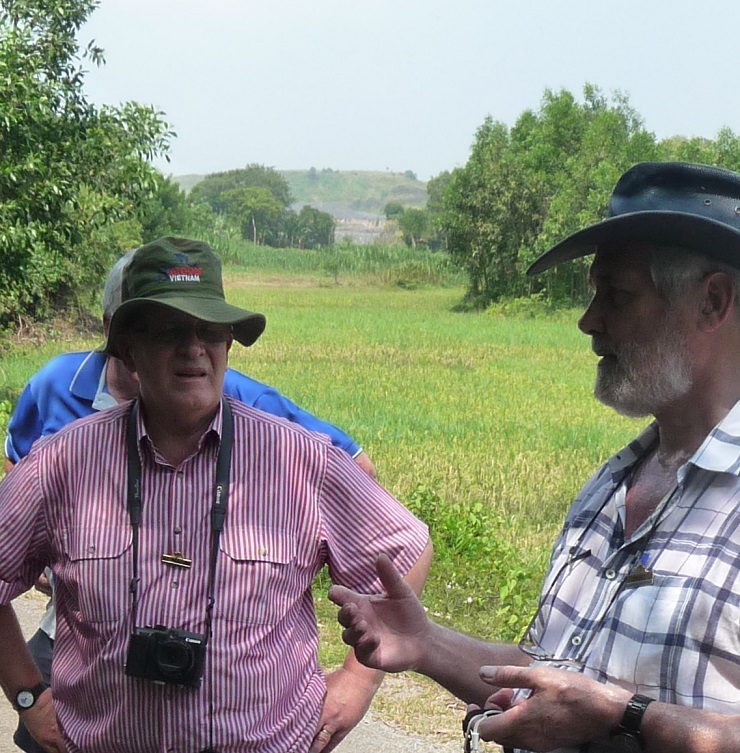 We then visited several key locations of the long DMZ campaign including 'Freedom Bridge', Gio Linh, Cam Lo Bridge, Con Thien (Hill of Angels), Camp Carroll, Rockpile, and on to Khe Sanh. the North half is blue. half an hour uphill in long grass & tangled vines. the entrance to Camp Carroll. which is exactly what it is! 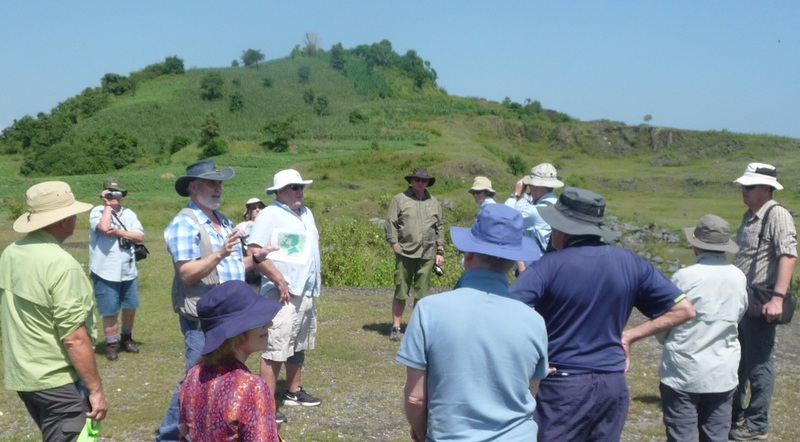 We then returned to Khe Sanh and the old airfield base - scene of the 77-day siege in 1968. 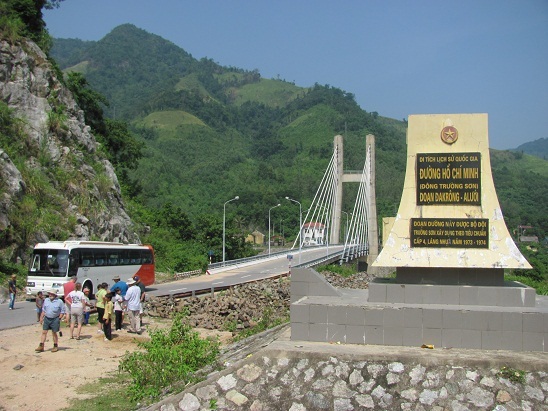 After Khe Sanh, we then crossed the Da Krong Bridge and drove up the Da Krong valley, past Tiger Mountain and down the A Shau Valley - both valleys were scenes of major US and ARVN operations during the War. 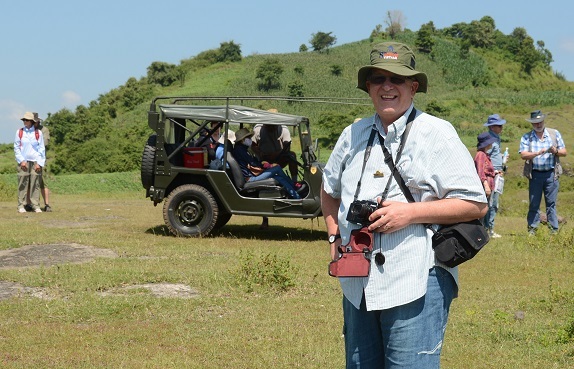 At A Luoi, we tried for a view of "Hamburger Hill" - scene of a major US action that, with the 1968 Tet Offensive and Khe Sanh, triggered the change of US policy that ultimately ended the War. Weather conditions in the valley rarely permit a good view of this mountain massif... (see the 2011 Tour Report for a view). 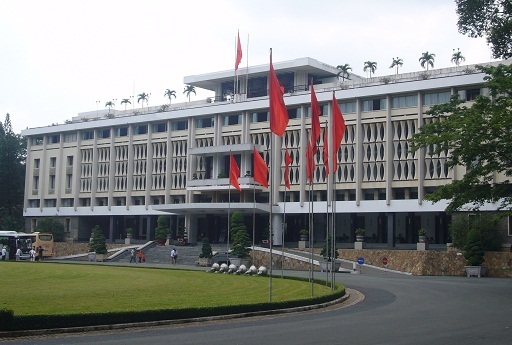 On return from the A Shau valley, we overnighted in Hue and next day bussed south to Phu Bai, Hue's airport and a huge base and Intelligence collecting facility during the war. 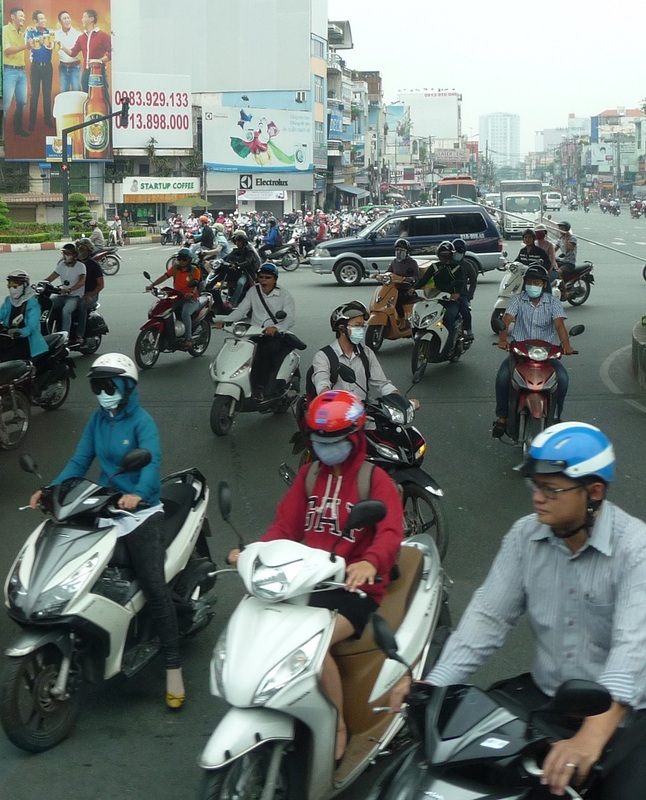 A short flight to Hanoi gave us enough time to explore the Old Quarter, where we stayed. 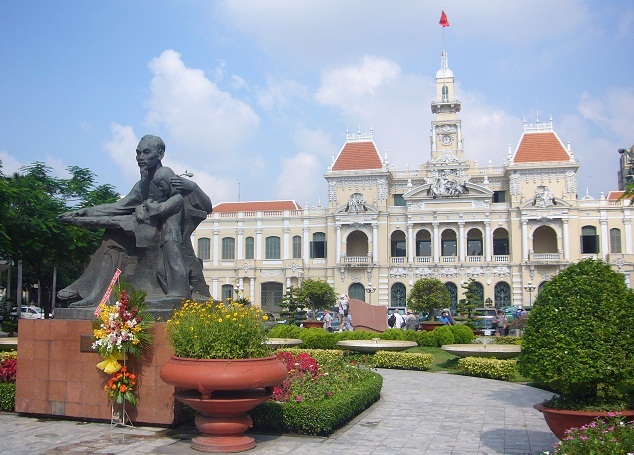 The next day we toured some of the city's sites including the Ho Chi Minh Mausoleum, the Army Museum (which displays the tank that breached the Saigon Palace Gates in 1975), the 'Hanoi Hilton' and lots more. 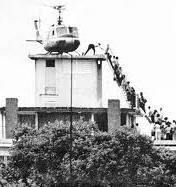 ...before we flew, next day, to Dien Bien Phu for a day and a night, staying at the new Muong Thanh Hotel. 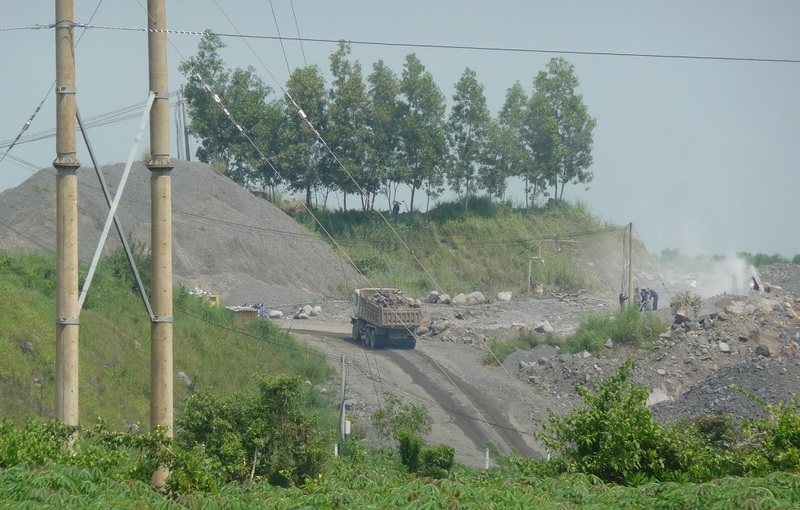 That afternoon we drove into the hills to see General Giap's bunker complex, from which he commanded the DBP battle. 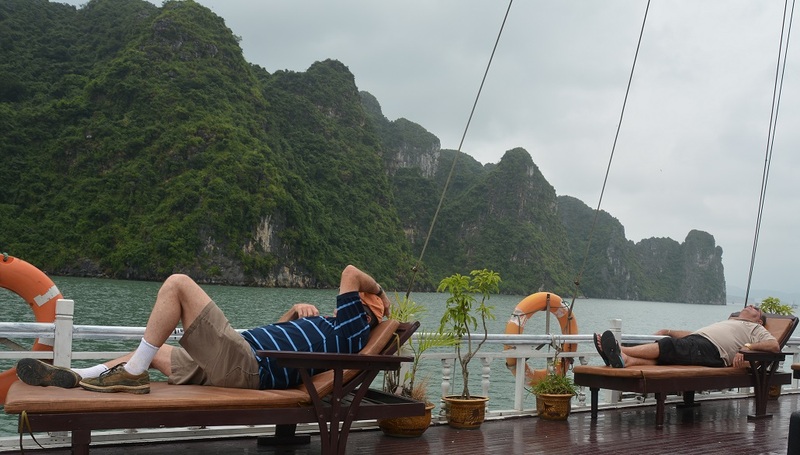 At the end of another hectic week plus, we flew back to Hanoi and drove directly to Ha Long Bay for a spot of R&R. 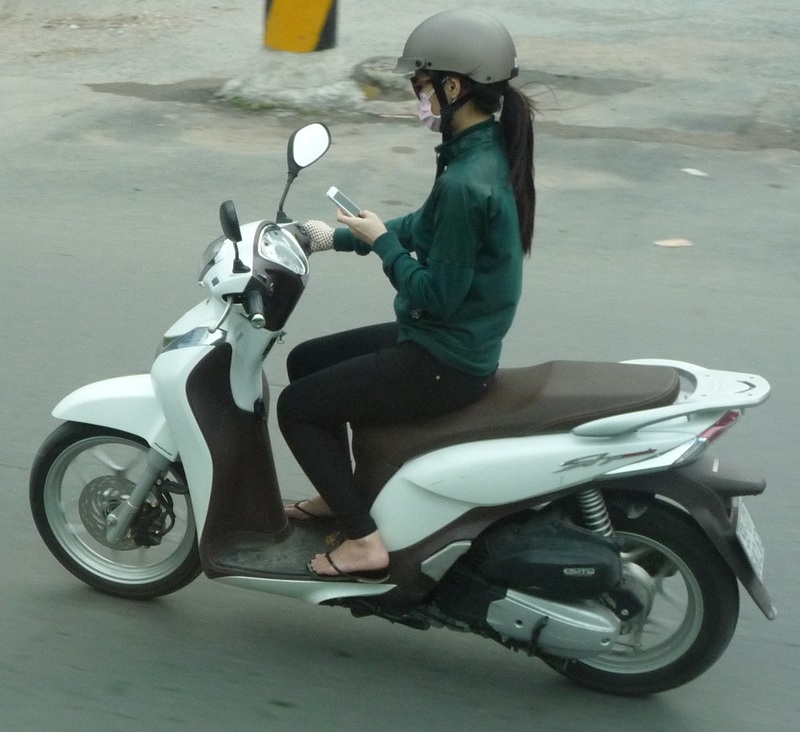 From Ha Long to Hanoi and flights home. All of the hotels were either 4/5 star or the best available in the more remote areas. Most meals and all gratuities had been included, so hands only went into pockets for personal purchases or personal tipping and drinks. Along the way, documentaries, presentations and discussions covered most of the significant events or places to be visited or seen. 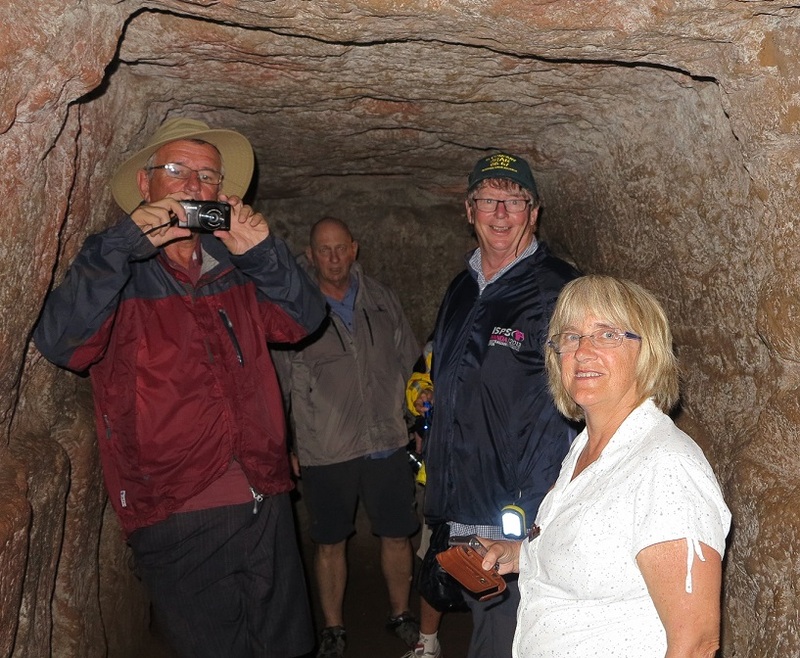 The Tour included some "surprises" not listed in the itinerary - but each of which were very much appreciated by the Tour. members. to see that ours was a very special group of people! which we can share with family and friends. All the best for the remainder of the Tour, and safe traveling. Another wonderful, informative, and worthwhile Tour/ Trek. who asked me if I could take him. Of course I couldn't say no, could I...? they joined this tour on the way home after a trip to Europe. talking ( or 'shouting' about ) all these years !! learning and gaining as much information about what they did in life. 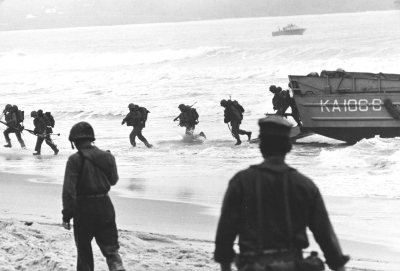 after my war was over in Sept 1969.
it is not something that is often done ... these days. 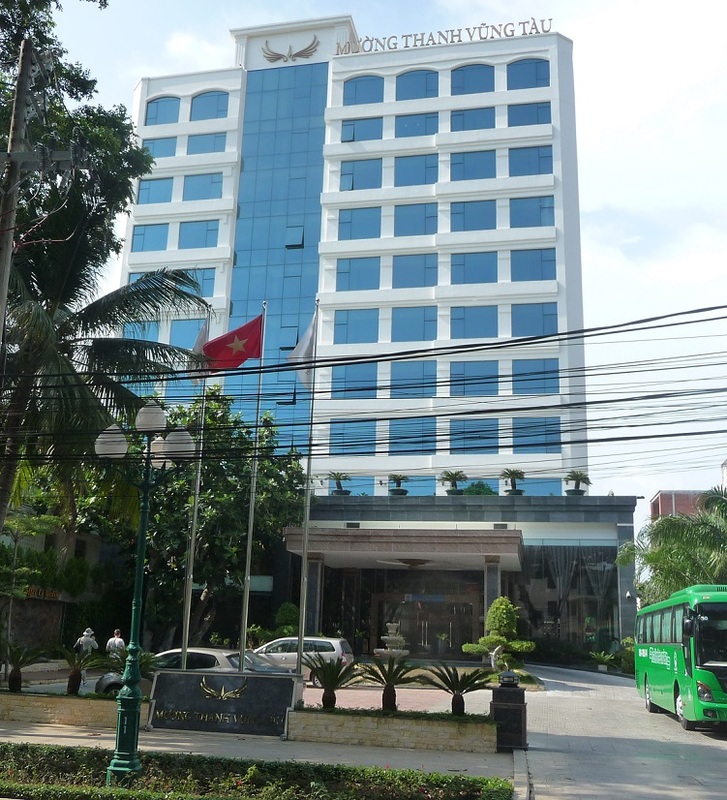 and his Tour Company OSC Viet Nam Travel. which is most of us OLD buggers! Thank you again for all your dedicated work. It was wonderful to be part of the 2014 trek. Now I just have to write the play! ... for the most interesting trip I have ever done in my life. 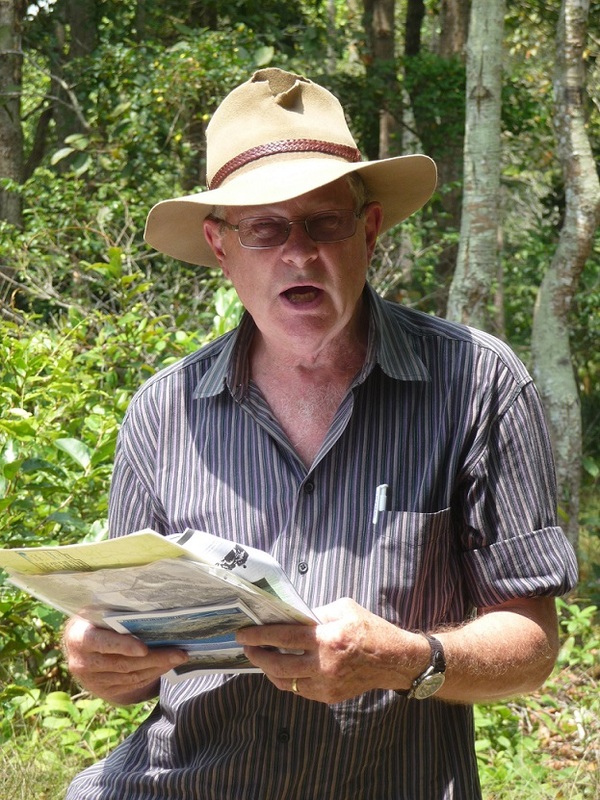 and for bringing the Battle of Long Tan to life for me. the hallowed ground of Long Tan with you. that they should sign up for your 2015 trek. 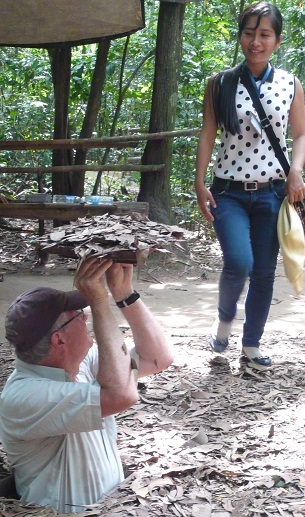 Thanks again to you and Di for such a fantastic time in Viet Nam. I learnt more about the wars there than I have in the last 45 years! Thank you again for a great adventure. Thank you once again for presenting a brilliant tour. and the battlefields in South Vietnam. I was wrong. The tour of the north you arranged for us was absolutely perfect! Your selection of hotels was excellent. The transport provided was first class. From the air-conditioned coaches to the very air-conditioned cyclos. The various internal flights you arranged were hassle free. for things to happen. All your timings were spot on. "on the ground" experience we were to encounter the following day. 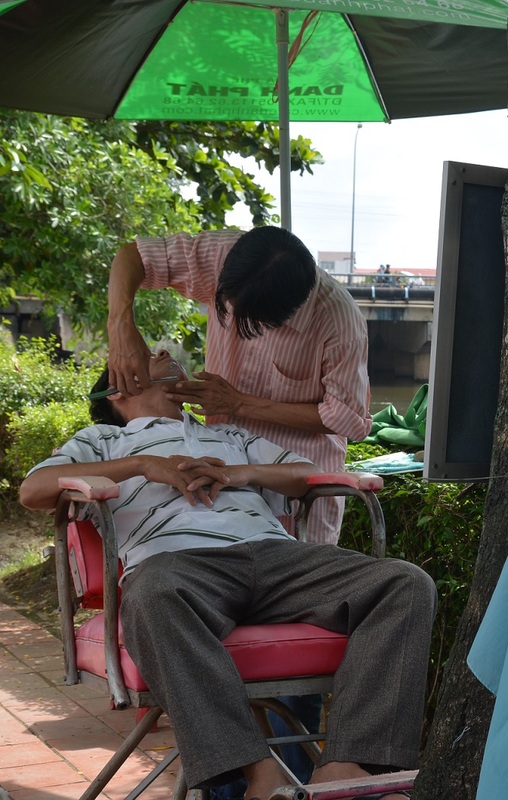 The free day in Hanoi was very welcome. mountains and trenches which we had enjoyed during the tour. and drink to our hearts content. riding back to the hotel as a complete group. 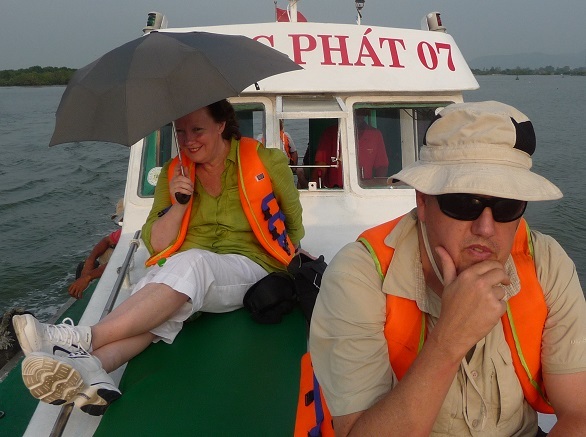 The final two days of R&R at Halong Bay was a delight. All the hard work was done. 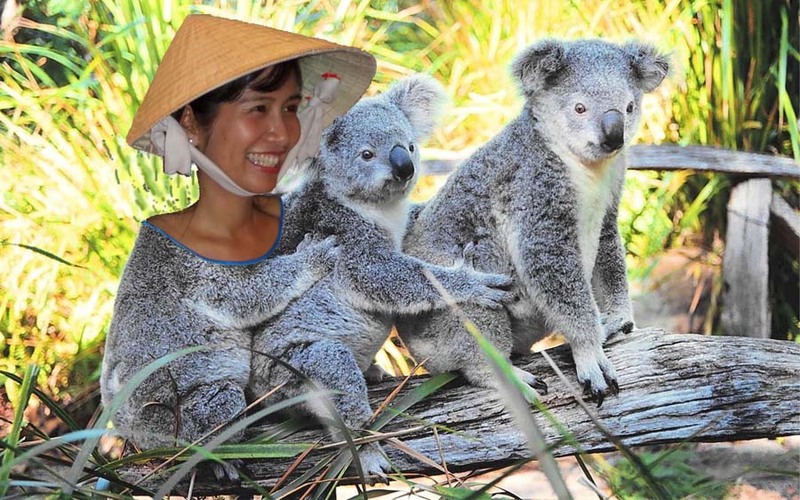 that this magnificent part of Vietnam has to offer. with total strangers when they share a common experience. and when we finally said, "Goodbye", it was to friends. Thank you, Dave and Di and Judi. so interesting, informative and enjoyable. and also I can�t believe how smoothly everything ran. but travelling with you was practically seamless. part of the trip in the first place. Another thoroughly enjoyable and enlightening tour itinerary. the NVN Decisive Battlefields Tour was born. for their untiring efforts and "Well Done" fellow participants. 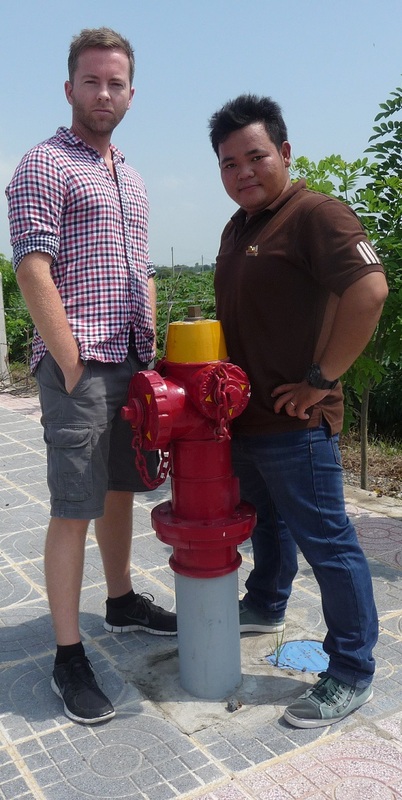 ( two red heads ) and old Ned Kelly aged 4 years on Tour. My thanks also to Judi for all her assistance pre tour. Thank you Di for the great read in the fab notes that you made. I know that Rosemary will also read them with great interest. to our 9 preceding weeks in Europe. and what a great team of fellow travellers! for a dinner or reunion - but Australia is just so big isn't it! and hope to catch up on a few others by email as well. the northern tour if not the full tour. Am also trying to talk Michael into it again as well. and had a fantastic time. she "now knows more about the Vietnam Wars than she ever expected to know". at Dien Bien Phu at the time of her birth! and give a very good insight to the major American and French involvements. and Dave provides excellent content throughout. and especially about the Battle of Long Tan. in order to get a more complete picture. with one of my colleagues who is very interested. 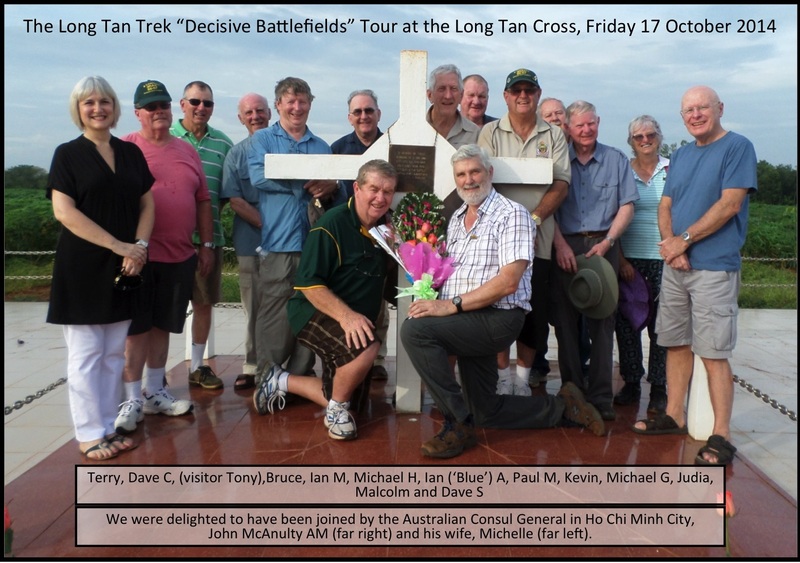 The ANNUAL Tours - the Long Tan Trek and the Decisive Battlefields Tour - have been planned with very much the same content and sequence as these 2014 Tours. 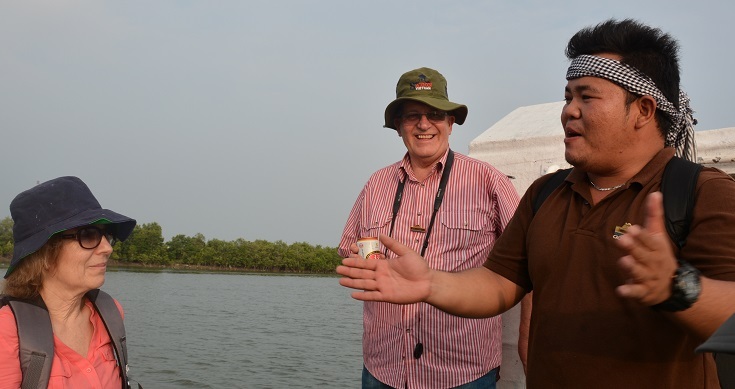 In the south, we've added an extra night in Vung Tau giving a free day to revisit old haunts, and retained the Cu Chi visit. 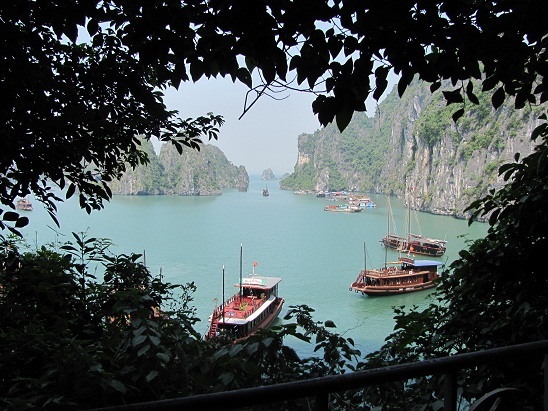 And in the north, we includes a two-night stay at Hoi An and two nights in Ha Long Bay - BOTH World Heritage listed locations. "How much for a ride back to the hotel?" "WHAT? Two dollars??? I'll walk!" a recognised form of suicide...? about the secluded "Country Retreat"